Which is better? 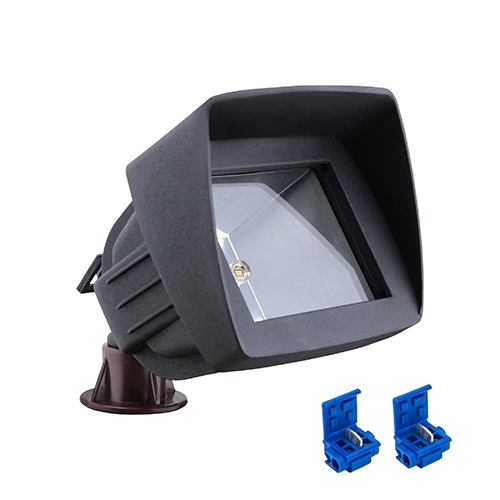 Watch our comparison video of our LED-FG1021-BK low voltage outdoor landscape lighting spot light to the discontinued Malibu 8301-9601-01 low voltage outdoor lighting landscape flood light that are popping up on websites at reduced prices. Scott goes over the pros and cons of each fixture and why one would work better then the other depending on your lighting application. One of the benefits of both outdoor landscape lights is that the light bulb is replaceable reducing landfill waste and allowing for greater flexibility in the future if ever you decided to change color temperature, beam spread or adopt a better new technology. One of our customers was so gracious to share with us the result of their LED outdoor garden lighting project. They used eight L1081-BK-6-WW spot lights, one Malibu 8100-9120-01 120watt transformer and 480ft. of our low voltage 16/2 outdoor wire. As you can see from the photos below they did a wonderful job bringing energy efficient LED lighting to their outdoor landscape. One of the benefits of our LED outdoor black L1081-BK-6-WW key bullet spot light is that it's made with the environment in mind. The bullet spot light LED module is 100% serviceable. What this means is that the LED module inside the fixture can be swapped out with a different module for design purposes or replaced if it prematurely fails or if better lighting technology comes along. Most LED outdoor lights use an integrated system that is not serviceable limiting your design options or if it fails fills up the landfills when it's trashed. The L1081-BK-6-WW is made from aluminum with a black powder finish for long life durability that can withstand some of the harshest weather. Combined with the easy to use Malibu 8100-9120-01 120watt outdoor lighting transformer with digital timer and photo eye plus our quality low voltage 16/2 gauge wire, the 120watt size transformer and low wattage spot light leave plenty of room for future expansion. We have many complete LED outdoor landscape lighting kits to choose from that are sure to fit into almost any budget and design preference that's just a click or tap away! Swing by today and come make your outdoor space magical. One of our customers recently finished installing LED outdoor landscape lighting along the walkways around their home and they graciously sent us some images they took of the results. It was a rather large LED outdoor lighting project that consisted of seventeen of our LED-S215-BK path lights, thirty four of our gel filled low voltage blue connectors and one Malibu 8100-9045-01 transformer with photo eye and digital timer. As you can see, the landscape lights successfully filled the pathways with bright diffused LED light increasing the safety, security and value of their property.